I am selling my Sony SCD-CE775 5 disk Super audio CD player (SACD). This unit is in perfect condition and will ship with Sony remote. This unit has tons of great features and has 5.1 analogue outputs along with a TosLink optical output. I am looking for $100 plus shipping. E-mail me if you have any questions. Man, I can't seem to give this thing away. I don't know anything about lupodwdm, but I do know about the Sony SCD-CE775 because I've owned one for almost 3 years. I mainly use it for SACD playback but it is a decent Redbook player as well. 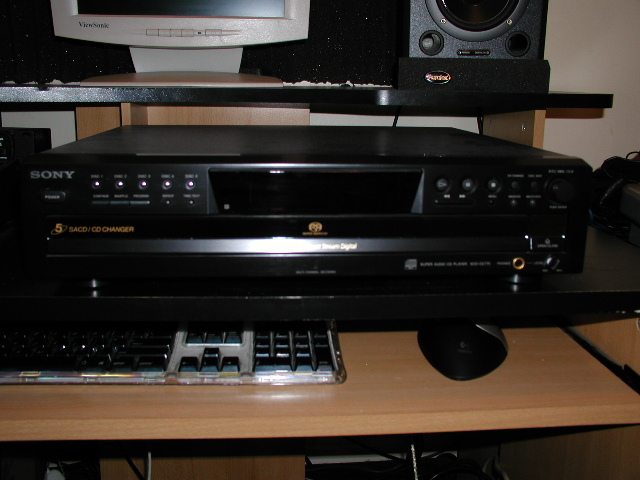 The SACD was good enough that I sold my SCD-C222ES (for a very nice price) and kept the 775. Anyone interested in SACD on the inexpensive should consider picking this one up. As I understand, the modders can also beef this one up for 4 or 5 bills and make it an excellent redbook CDP as well.